The Emeraude, a gem in Halong Bay. 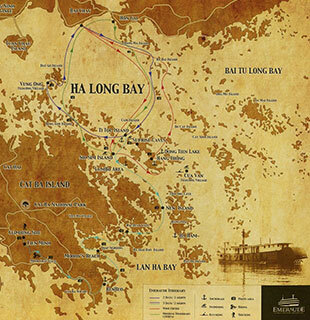 A mythical place, Halong Bay has seen a large white boat known as the Emerald – a successor to the canal boats of the early twentieth century – navigating its calm waters for ten years now. To celebrate this anniversary, the president of Apple Tree Hospitality, a collection that includes several boutique properties in Southeast Asia, has compiled testimonies and documents in a book that recounts tales of human adventure, a legendary Bay and a boat straight out of the past. Over a hundred pages long, the book covers historical facts from the beginning of the French presence and the story of the family of entrepreneurs who came from these latitudes to try their luck in the East. A simple but vibrant tribute to these pioneers of tourism.